The Lions of Little Rock is the second novel by Kristin Levine, the author of The Best Bad Luck I Ever Had (2009). When Marlee begins her first year of junior high in 1958 Little Rock, Arkansas, in the midst of a time when segregation is causing numerous problems, she is desperate for a nice friend she can talk to other than her older teenaged sister, Judy. Finding a friend will be quite the challenge for Marlee, especially since her shyness prevents her from talking to most people. Enter Liz, a new girl in town who is incredibly outgoing and direct, and instantly takes a liking to Marlee. When the 2 girls become partners in a major school project, Marlee learns to open up and gain the courage she needs to make their classroom presentation - and to begin talking to more people outside of her comfort zone. One day, Marlee arrives at school to learn that Liz is actually a colored girl masquerading - or more accurately, passing - as a white girl, and has been exiled to the school for colored students. Marlee and Liz then desperately find ways to reconnect and spend time with each other; even when circumstances become dangerous enough to put themselves and their families in harm's way. The Lions of Little Rock is a very quick read! Marlee's quirky, first-person narrative and innocent voice is quite addicting; plus, the novel is written in short, 2-3 page chapters that will have every reader racing along - in fact, I was able to finish the book in under 24 hours. Levine's research on the subject of segregation during this time period is very thorough. Adults and teens alike will enjoy the story, the plot of which will sincerely keep you guessing about the outcome until the very end. 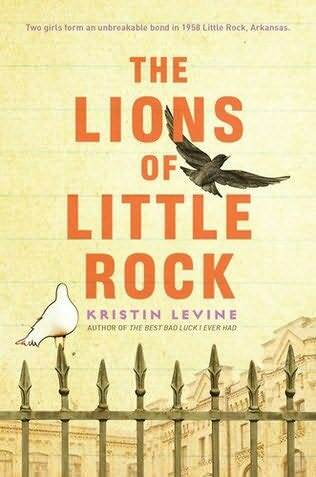 As I read The Lions of Little Rock, I thought of how perfect this book is for teens and young adults from an educational standpoint. The novel is true historical fiction, and is written so tastefully that readers - especially teens - will be dying to learn more about the topic of segregation and civil rights without even realizing it. Books such as these are what sparked my interest in various topics growing up - such as how The House of Dies Drear (1968) by Virginia Hamilton sparked my interest in the Underground Railroad and Harriet Tubman. I highly recommend The Lions of Little Rock to readers of all ages, and fans of this novel will also enjoy The Dry Grass of August (2011) by Anna Jean Mayhew. What are your favorite novels on the topics of segregation and civil rights? Have you read Kristin Levine's first novel, The Best Bad Luck I Ever Had? Click on the pictures of the books below to review them in more detail on Amazon.com. How many pages are their? Hi! There are 320 pages in this novel. The book is awesome! It is now my favorite book!